The kids room is likely to be a lively and well used space. Happy memories and made here so it is important to create an environment that makes time spent in the bedroom both great fun and practical. 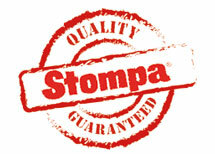 Here at Stompa our ranges are built on decades of experience and feedback from our most important customers-the kids themselves! On our website you can find children's room ideas and inspiration for everything you need for your childs bedroom. We know that kids like colour and have their own preferences that change as they grow. Consider options for coloured doors or fabrics to add a splash of colour. Bedding, curtains, throws and scatter cushions are great to create a co-ordinated look. Complementing soft furnishings with wall colours gives you flexibility and options if you change the colour scheme later on. Stompa tip: keep colour schemes to a maximum of three colours for furniture and soft furnishings, one stronger colour and one or two complimentary colours to create an interesting colour scheme to a room. Skateboards and soft toys all need somewhere to live so Kid's storage solutions are a crucial part of planning your childs room. Think about combining children's storage boxes, cupboards and drawers to maximize space for your childs hobbies and interests. Dont forget to include some open compartments for books, photos and personal treasures. These can turn a room into a treasured space and help create an inspirational environment for your child to play and learn in. Our beds cater for toddlers right through to teenagers. See our kid's novelty beds for great themed fun and kid's bunk beds with storage to make the most of space. Finally, kids need space and a pleasant environment to study and do their homework. See our range of practical and space saving desk solutions for more inspiration. 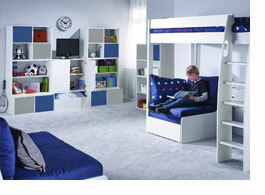 To view our range of Childrens bedroom furniture please click here.